Jesus’ parables are some of the most famous passages in the Bible, especially the Good Samaritan, the Sower, and the Prodigal Son. But Jesus gave us many parables, so why do we choose to just focus on a few? Is it just because they’re familiar? Why do we think of these as the “good” parables and others as the “minor” parables? I suppose we could argue that we tend to focus on the longer parables, but we also like the wheat and tares story, and that’s fairly short. So why is it we skip over some parables, like the Shrewd Manager or the Growing Seed? Ready for my theory? Perhaps it’s because we don’t like parables that confuse us (the manager is good because he cooks the books? ), or maybe because it doesn’t fit our own worldview. We want to read the stories of how God forgives our worst sins, or “safe” parables like the Sower (“safe” because we know we’re the good seed, right? ), but not the ones that make us re-evaluate ourselves. In our chapter for today, we find the story of the Growing Seed. Without claiming any deep theological insight here, it seems like God is telling us that ultimately, everything is outside our control. We can plant, and water, and fertilize, and weed, and all this, that, and the other, but nothing we do can force a seed to grow. It just grows. Moreover, it takes a process. 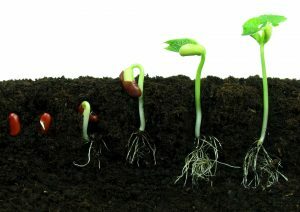 The seed doesn’t turn into the full-grown plant overnight. It goes through a slow process of foundation (the stalk), maturity (the head), and finally production and reproduction (full kernel). No matter how much you encourage and yell and prod a plant with electrodes, it will still take time for that plant to grow. And that makes us uncomfortable. Assuming the Seed is the Word, we don’t like the idea that growing in Christ takes time. We want to have a process of growth that is under our control, on our schedule. We love the stories of our transgressions being forgiven (the Prodigal), but we’re a little less excited to dwell on the idea that ultimately we need to depend on God for everything, or that things may take time rather than respond to our demands for speed. And it’s not just growth in ourselves. Many of us desperately want to “force” the Seed to grow in someone else, to make them get saved. We preach on hellfire, we cajole with God’s love, we may even use excommunication or affection to try to convince someone to trust God. But ultimately, the growth of the seed in others is outside our control. We want so desperately to have Christian maturity under our control, but the heart of the gospel is giving up our control to the Lordship of Jesus. And that includes our own growth and the growth of others. We have to trust that growth is happening, even if it’s below the surface, just out of sight. Take heart. Sometimes that Seed is growing; it just takes time.